New and incoming Bossier Parish teachers were welcomed to the Bossier School System by the Bossier Chamber and the business community at today’s New Teachers’ Luncheon. Courtesy Photo | Melissa Couch presents new teacher Katie Chavis with 25 7’ inch tablets for use in her classroom. 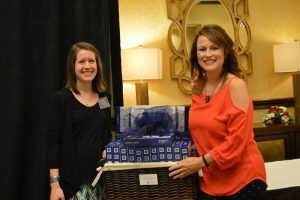 This annual event provides new teachers with startup materials and prizes to help get them off to a great start of the school year. Nearly 120 new teachers attended today’s luncheon, sponsored by Barksdale Federal Credit Union. New teacher, Katie Chavis, won the grand prize of 25 7’inch tablets for the use in her classroom, which were donated by Barksdale Federal Credit Union. Bonnie Dubin with Motivate Me was the guest speaker and provided attendees with helpful leadership and teamwork tips to utilize in the classroom. Teachers will return to their classrooms Aug. 5 with students returning Aug. 10. Kindergarten students will begin Aug. 17.